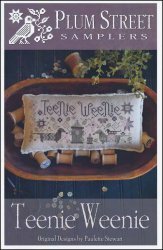 Teenie Weenie [D7164] - $10.00 : Yarn Tree, Your wholesale source for cross stitch supplies. Cross stitch pattern from Plum Street Samplers. Stitch count 158w x 63h.